After long time, we are going to publish another Bangla Newspaper blogger template. This release only for all Bangladeshi users. After success of releasing Songbad71, now we are publishing another new template. This template is only for who want to make a professional bangla newspaper site with blogspot platform. Yes, it is possible to make a responsive newspaper site with blogspot. 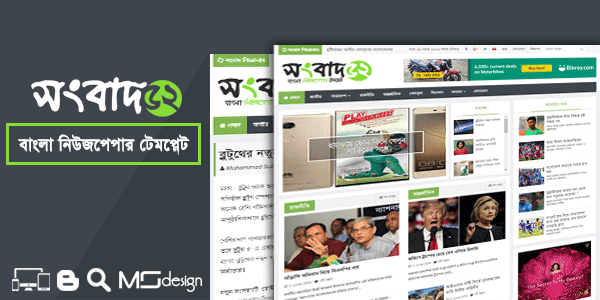 Songbad52 is a professional, high quality, responsive, Search engine friendly and mobile friendly bangla newspaper blogger template. MS Design always publish creative and SEO friendly blogger template with low price. Songbad52 is a premium newspaper template for blogger. 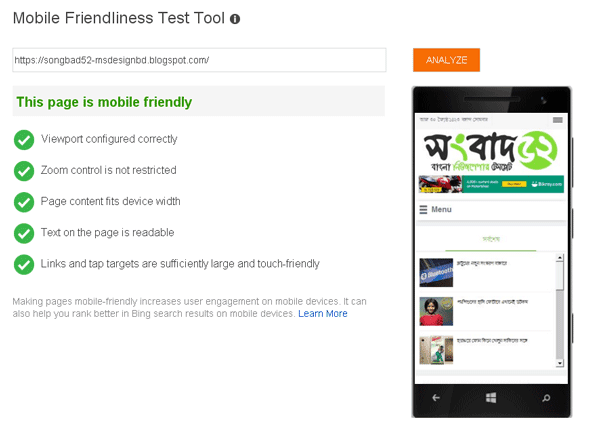 We hardly applied some special features on this Bangla Newspaper blogger template. We made it with some important ad slot. Proper advertisement ad slot is very important part of your revenue. We add 5 responsive advertisement ad slot on this template for increase your blog revenue. This is top label and high quality newspaper template for Bangladeshi news portal. If you want run a newspaper blog with blogger, then you should use this template for your blog. Songbad52 is similar with News52 blogger template. On this template we use some extra script for make this template more perfect, better and pretty. On top bar, we used Breaking news ticker with social icons, search bar and Bengali date. On homepage you can use 11 posts box with different style. Recent post slider is also available. Responsive and mobile friendly is very important for every blog and it is too much important when it come news portal site. Songbad52 is 100% pure responsive and mobile friendly newspaper blogger template. 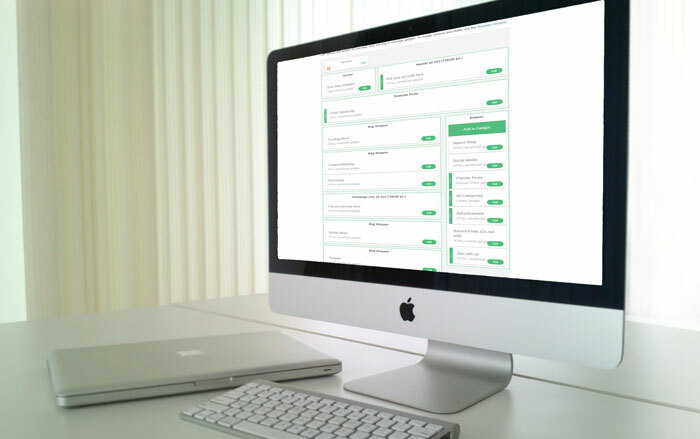 We optimized this template for all kind of mobile device. So this is template is compatible with all kind of smartphone device. Songbad52 is a professional Newspaper blogger template for Bangla news portal. It is best template for Bangladeshi newspaper site. It is very easy to customize this template. Drag and drop admin panel and one click color change. Hope it will be perfect template for your newspaper site or Bengali magazine site. You can applied unlimited color on Songbad52 blogger template. MS Design always develop easy blogger template that anyone can edit without any coding knowledge. We used Blogger Template designer option on this template. You can change whole template color with one click. 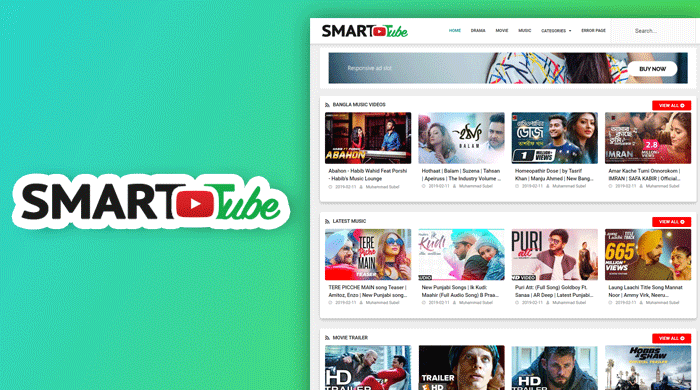 Smart Tube Professional Video Blogger Template! If you're looking for a smart and responsive video blogger template, then smart tube blogger template will be good select. It is highly optimized for a video blog. If you're running a video sharing site with blogger platform, then make your blog more professional with smart tube template. Now let's check some awesome features of it. Here is another blast for all blogger lover. Sanai is the high quality and professional blogger template with high speed optimized. 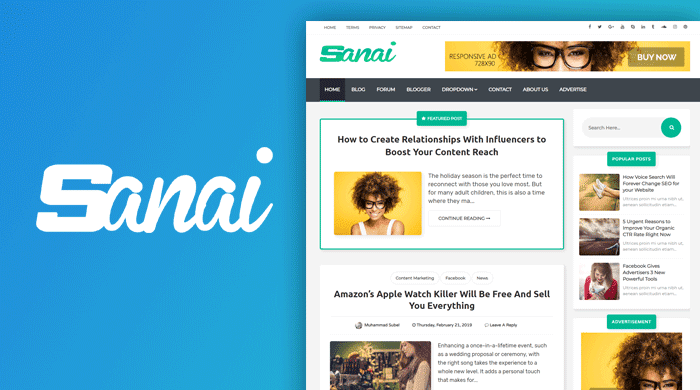 If you running a blog niche website and looking for high quality and speedy blogger template, then download the Sanai Blogger template for your blog. Free download Helio Grid Style Blogger Template. 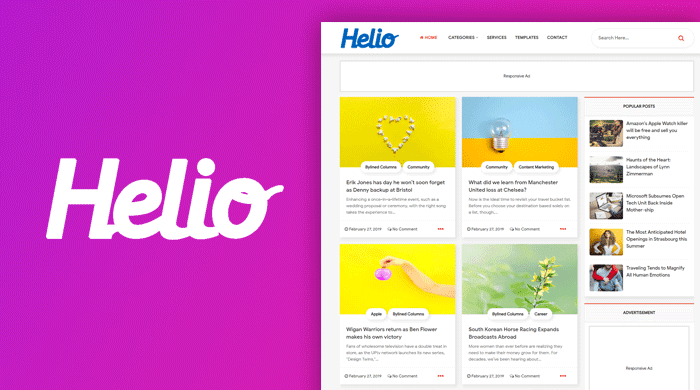 Helio is the ultra smart and modern gird style blogger template for Blogspot. If you're looking for a nice and smooth responsive blogger template, then try the Helio Blogger template by MS Design. Free download premium blogger template Helio. 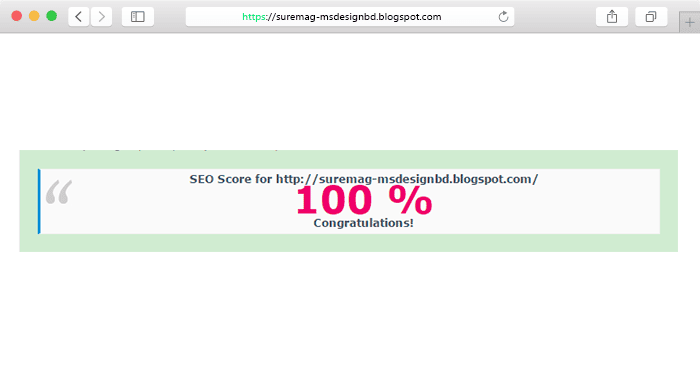 Sure Mag - Best Magazine/Newspaper Blogger Template 2019! This is another best release of MS Design. Sure mag is a professional and high-quality free magazine blogger template. This is compatible with all kind of newspaper and magazine blog. If you're an owner of digital magazine blog, then it will be perfect blogger template for you. 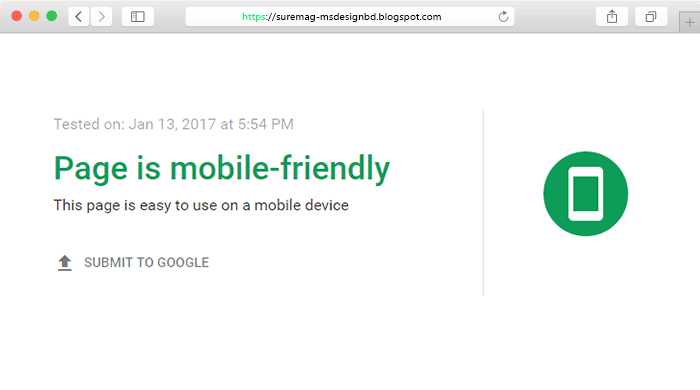 Sure Mag is SEO friendly magazine blogger template and highly responsive designed blogger template that compatible with all kind of smartphone and tablet device. Sure Mag Professional Magazine Blogger Template! After a long time, MS Design publishing another MAG style blogger template of 2019. We have already shared some awesome, Creative and professional Magazine Blogger templates these are already got most popular. Now people are interested in making his/her own magazine blog with blogger platform. Mag style blogger templates are now popular search term. This time we're releasing first blogger template of 2019. 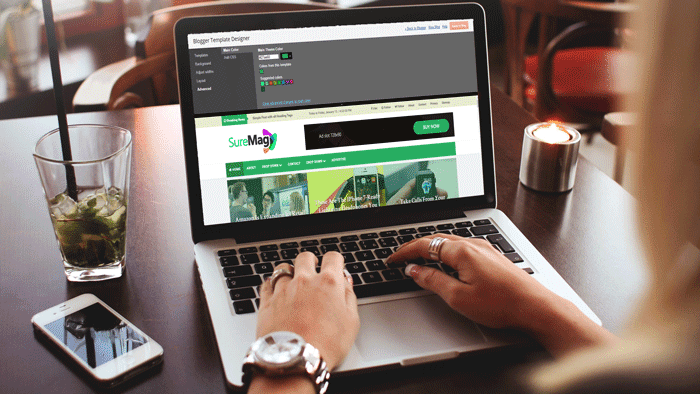 Sure Mag is a Magazine style professional blogger template for Blogspot platform. Sure Mag blogger template is similar with our previous News52. But Sure mag is lots of features, super fast, SEO and Mobile friendly. 15+ Best free Blogger widgets and Plugins 2019 - Welcome to our another blogger tutorial. Blogger's popularity increasing day by day. Blogger is the best and CMS blogging platform you know. It is the most powerful CMS nowadays. Maximum people choice blogger for it's easy customization. People can easily upload custom blogger templates. That's why maximum newbie blogger's first choice is Blogspot platform. In this post i will share 15+ free and best blogger widgets that are mostly needed in every blog. I can hardly says these widgets are best blogger widgets and gadgets 2019. Every bloggers know that, we can't add any widgets or plugins like wordpress. We have to need add any blogger widgets or plugins manually. Some people are always looking for beautiful and essential blogspot widgets for his/her blog. Today gonna to share 15+ hand-picked free and best blogger widgets and i hope that, these blogger widgets are may helpful for you and its absolutely free widgets. Discover now our 10+ best responsive and SEO optimized free blogger templates. It's a best blogger widget to promote facebook fan box into your blog. Sidebar Floating Facebook Like Box For Blogger - is a widget for adding a like box on blogger in sidebar. Facebook like box for website or blogspot is a important widget to increase fan page like. You can easily grow up your facebook fan page like using facebook like box. This is the best blogger plugins and widgets to promote facebook like box. Today i am share awesome and beautiful facebook like box for website. This a sidebar floating facebook like box. When visitors mouse hover in facebook icon, then it Floating and open a like box from sidebar. This script i founded around internet. But i customize this script with CSS and get up an awesome look. You can add this code also any wordpress blog. Flat Social Share Button for Blogger - install this social button widget in your blog. By using this blogger widget you can add share button for blogger posts. It's a best sharing button for blogger. Some users sometimes looking for facebook share button for blogger. But in this widget we bring some more social platform. This is simple social share widget for blogger. Sometimes some users looking for a unique, minimal, flat and simple social share buttons for their blog. In this blogger tutorial i will share a awesome and most popular CSS social share button for blogspot blog. A social share buttons is a important part in every blog. Its the greatest way to increase every blog traffic. When users are found your blog post in helpful then they will to share your posts on social media. In your blog's has a attractive social share icons, then they easily share your content in their account. This is another best and useful gadgets for blogger. Some users want to customize popular posts widget blogger. I can hardly say, it is the best popular posts widget blogger and perfect for every blog. Blogger Popular Posts widget with Thumbnail and Auto Numbering - in this tutorial i will share how add a popular posts widget in your blog with Thumbnail and auto numbering. Blogger popular posts widget is a customize able widget with CSS. Thumbnail popular post is most popular nowadays. That's why you should use this blogger popular posts widget with thumbnails for your blog. Subscription box widget for blogger is a another best and essential blogger widgets. Feedburner email subscription widget can increase your blog traffic hugely. Email subscribe widget is most important part of every blogger. Do you know what is email subscribe widget? Yes! this is collect huge amount traffic for your blog. Today i am share 2 beautiful blogger email subscription widget for your blog. Its the awesome and cute email newsletter subscribe box widget for blogger that created with pure css with fontawesome icons. By using this email newsletter forms you can also use your social media links like Facebook, twitter, linkedin, google plus, pinterest, vine and instagram social icons. Attractive subscription widget box is better for every blog. Our first widget is more attractive for blogger. Pop up facebook like box is most trending widget nowadays. Popup facebook like box widget for blogger may increase your blog traffic. Targeted visitors are most important of any blog. Retention blog visitors more and more important. If you want to increase your facebook like then should promote your page in your blog with your blog's users. Then you will get more like from your users who visit your blog. Adding the pop up like box is most essential for get more like. 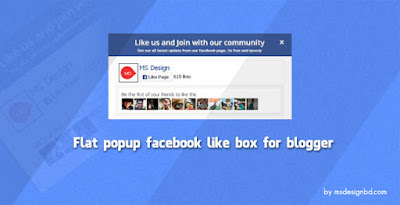 So today i am gonna to share a tutorial about pop up facebook like box for blogger. Social icons are most important part of any blog now-a-days. We see any where any website and any apps, they promote their social media links with attractive social icons. In this tutorial, we take a look of creating a beautiful and simple social icons widget with hover effect for Blogspot Blogger. I already named this widget: Nicer Social Icons Widget with hover effect for Blogger. Some people want to show their author bio in every post's below. This widget is specially for his/her. Install this author bio box with social icons for blogger. Blogger Author Bio box with Social icons - in this tutorial i am share how to add an author bio box in blogger with social icons. By using this author box you should easily add author's avatar, author's bio (Description) and author's social media links. For request of some friends today i share this tutorial how to install blogger author box. I can hardly say, social media is a important part of blogger SEO. To promote your social media, you have must install attractive and beautiful social media icons widget in blogger. This tutorial help you adding a free social media icons in blogger. The best social media buttons for blogger i shared in this blogger tutorial. Some friends requested me that, how to add social media icons widget in blogger. That's why today i am came with 3 awesome style and fontawesome social network icons widget for blogspot blogger. By using these social media icons widget you may increase your blog's look. If you looking for a social media widget for blogger , then this tutorial for you. Social icons and social media icons is play an important role on every blog. It help you to make connection with your visitors. Hello my dear friends, hope all are fine. Today i am going to show a awesome widget for blogger and that is weather widget. You can easily add a weather widget to your blog using html code. By using this html code you can Create a Current Weather Widget easily. This widget from accuweather.com. You know, accuweather always give better information about weather world wide. That's why we add a weather widget to our blog or website using accuweather. Ok, let's stat. Breaking News Ticker widget for blogger - is a most important and popular tool for blogger. Specially News base blog's must have a breaking news ticker on their website. Today i am share the exclusive tropic. Adding this widget, you can easily shown your latest or recent posts one by one. This widget is help you to show recent posts as a ticker. In this tutorial i will show you, how to add automated breaking news ticker for blogger. Every wordpressian can add latest posts ticker by adding some wordpress plugins easily. But every blogger users need to do it by adding some code manually. In this post, i shared a beautiful breaking news ticker for blogspot blog. Animated Social Share Button For Blogger with CSS - is a share button that is make your blog more attractive. If you search for share button on internet, then you found many results like Adthis, Share This, Simple Share button, Addtoany etc share button for blogger. Those are mostly helpful and workable. Today i am share an awesome animated mouse hover social share button for blogger. This share button is fully customized with CSS. Using this share button you should add Facebook, Twitter, Google+, Linkedin and Pinterest share button on blogger blog. Blogger Author Widget with CSS3 - in this tutorial i shared a author widget for blogger. Yeah! its a great tutorial for all bloggers admin. Specially this tutorial my helpful for who run personal blog. A beautiful widget is only for you. Flat, Clean and responsive. You should add 4 social icons with your links. Twitter, Facebook, Dribble and Google Plus icons. This widget will work with CSS3 transition hover effect. When you mouse hover on this widget, then it open other part. Its social icons part. If you wanna see a demo, look at our first widget. Popup email subscription or newsletter widget for blogger another essential widget. Using popup email subscribe box you can hugely increase your feed subscribers. Pop up Email Subscribe box for Blogger - is a blogger widget using jquery. This subscription form created with css3 and jquery. In this tutorial i shared how to add pop up email subscription box for your blogspot blog. By adding this widget, you should easily increase your blog readers. It's a better way for increase blog readers. I hope this fresh pop up email subscribe box help you to increase blog readers. Now lets start the tutorial. 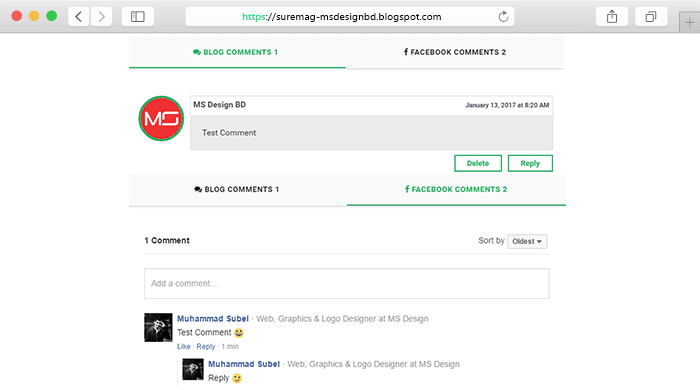 Facebook comment box is another popular comment system in blogger. Latest version Facebook comment box for Blogger - The Comments plugin lets people comment on blog post on your site using their Facebook account. If people wish to they can share this activity to their friends in News Feed as well. This comment box also contains built-in moderation tools and special social relevance ranking. There have been many facebook comment box in internet but today i am share the latest version of facebook comment box. Recently facebook developer update their Facebook Comment box plugin version v2.3. The main facilities are using of facebook comment box is, visitors are easily explain their opinion about your content and admin can catch his/her visitors easily. We'll continuously add most popular and attractive blogger widgets in this posts. Subscribe Now for all latest blogger widgets and free blogger templates. If you have any request or any question about blogger widgets, then feel free to discuss in comment section. I will try to my label best to solve you problems. You can also directly contact with me on Facebook.